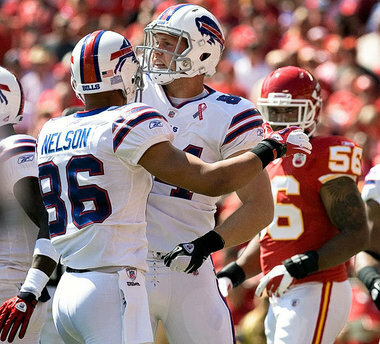 There isn’t too much to say about the Buffalo Bills’ 41-7 win over the Kansas City Chiefs. The Bills dominated every facet of the game on their way to the most convincing Bills win since the 2003 opener. Ryan Fitzpatrick was efficient under center and made some serious throws on his way to a four touchdown performance. Just think, he is 26 touchdowns away from Jerry Sullivan strolling down Hertel in his underwear. Scott Chandler looked like Pete Metzelaars while hauling in a pair of TDs. For the first time it looks as if the Bills have a valuable target at TE since Jay Riemersma left for Pittsburgh. The receiving corps didn’t miss Lee Evans as David Nelson proved to be an excellent slot compliment to Steve Johnson. Nelson’s size creates mismatch problems all over the field, I see him continuing to grow and sharing a similar skillset to Aaron Hernandez in New England. Roscoe Parrish and Donald Jones weren’t particularly effective, despite Jones’ touchdown grab. I wonder if Nelson coupled with C.J. Spiller as a slot threat will reduce targets for the two wide outs. I can safely say Jones will likely lose touches, I doubt Parrish will be factored out of the offense. Fed Jackson was stupendous as the primary back, it is too bad that he didn’t get a touchdown to cap his 112 yard day. Still, it is obvious he has the exact skill set to be an every down back in the NFL. It will be criminal if the Bills allow him to leave. They need to pay him the money he deserves and it needs to be done yesterday. Meanwhile Spiller still doesn’t know how to hit a hole, he had two good slashing runs (one for a TD) but was rendered useless otherwise. He still has quite a bit to learn in terms of finding lanes and utilizing his blinding speed. If he had the same vision that Jackson has he would be a 1,500-yard running back. Despite the offensive explosion, it was the defense that impressed me. They surrendered only one long scoring drive and managed to force three turnovers (one on special teams). Shawne Merriman was sound but not a difference maker, hopefully his apparent shoulder injury is a non-issue (UPDATE: It seems as if all is well with the linebacker). What was nice to see was the fact that Merriman really wasn’t needed. The entire linebacking corps played a good game and the revamped line controlled play. Whether it was Merriman, Danny Batten or Alex Carrington in the game they Bills received a good pass rush and great run support. Even Chris Kelsay looked the part in his second season playing from a two-point stance. To the credit of the defensive staff, Kelsay had his hand on the ground quite a bit, right where it should always be. Only a handful of runs reached the second level along with only a few big pass plays. Of course, being the NFL, that will happen. Nothing resembled the beating the Bills suffered last year on the ground. That is really what showed me that this is an improved team. Outside of the touchdown drive and the missed field goal, the Chiefs never threatened. Sure, Jamaal Charles found some holes, but it is to be expected. This isn’t a video game. It is important for fans not to assume the Bills are destined for greatness. Not yet, at least. They showed serious promise and a certain amount of dominance against KC. The Chiefs did seem pretty out of it and I fear that the win may diminish if KC continues to flounder. A win against Oakland would do a lot for this team’s stock. Even though there were few weak points, the offensive line needs to continue to improve. They played a great game yesterday and that type of play needs to continue. If that happens the Bills will certainly threaten to break .500 and even sniff a wild card berth. Until week four or five I find it hard to definitively say where this team is headed. It just isn’t a fair assessment. Although, a successful season would be more than welcome for the fans who have suffered through such a terrible decade of football.